Wer im Bereich Intranet arbeitet und an einem persönlichen Erfahrungsaustausch interessiert ist, ist bei uns richtig: Austrian Intranet Dialog V, ein Treffen von Leuten, die beruflich mit dem Thema Intranet zu tun haben. Wo? Fonds Soziales Wien, Guglgasse 7-9, 1030 Wien, Österreich. Gastgeber ist diesmal Michael Hofmann. Anmeldung: Über Xing oder gerne auch direkt bei mir. Last but not least: Wer nicht bis Ende Oktober warten will, kann jetzt gleich mal in unserer Xing-Gruppe Intranet Managers Austria Mitglied werden und sich ab sofort virtuell mit anderen Intranet-Interessierten austauschen. Wir freuen uns über neue Mitglieder! Twitter what? I am definitely not interested what other people are doing right now! Well, is there a need for us to move up this latter? Reading that „Twitter is growing by leaps and bounds“ (see details here) I think corporate communications people in Austria need to find out more about twitter, even if there are things that might annoy them. Because if millions of people use this tool of communication in order to relate to each other, there must be a reason. I think, especially for internal communications twitter opens tons of options. And this is the most difficult task: to find out how tools like twitter could improve internal communications and, eventually, create better relations (in case of internal communications amongst co-workers an/or management and employees). 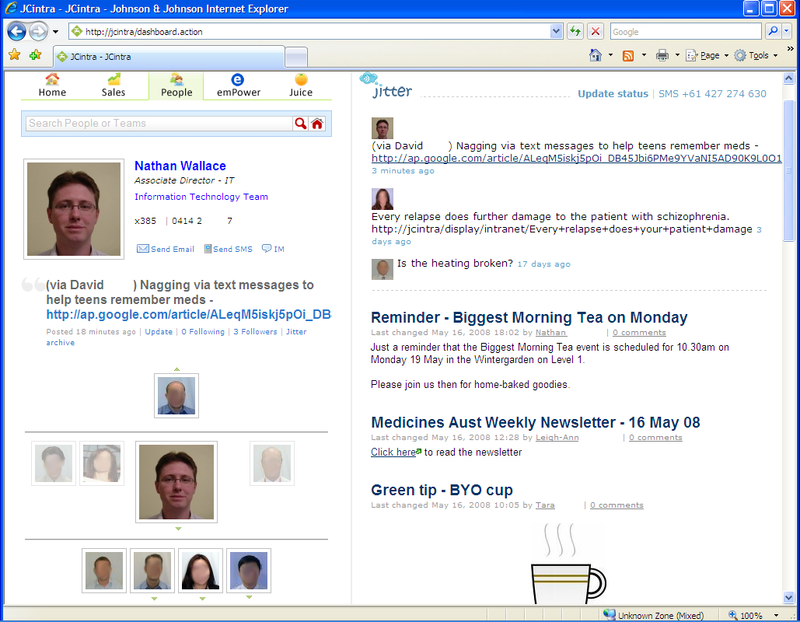 Jitter is one prominent example for enterprise microblogging. What I really like is the combination with intranet people search – this way it certainly becomes a tool for building relations between employees (and making them visible, too!). First step must be that at least some people have personal experience (e.g. using Twitter itself or similar tools on the internet). Then, there must be a sort of concept which also includes the outcomes desired – with this concept you must convince the management of the value of microblogging. Next, the implementation within an intranet must be designed carefully – ease of use is a key issue (as we see from the example of Jitter above). Promotion: When actually going live with a microblogging solution for the enterprise, you need to tell everyone why microblogging will make their lives easier. Otherwise, they won’t be able to move up the 5 stages of twitter acceptance. Maybe, it’s best to rely on microblogging evangelists who engage in a sort of viral/guerilla campaign. Finally, there must also be some kind of evaluation – you need to be able to prove that microblogging does really create better relations and, eventually, leads to a better performance of your company. I am writing something for work … about lawyers and blogging, and I thought part of that could be published here … actually, this is a kind of introduction to blogging for the audience of lawyers – with a few links to LawBlogs and other useful resources on the web. Please feel free to comment. Universal McCann (PDF, 3,58 MB, published in April 2008) reports that „blogs are a mainstream media world-wide and as a collective rival any traditional media.“ The survey shows that there are 184 million active bloggers and 346 million readers of blogs worldwide. Globally, blogs have a reach of 72.8% among active internet users. Corporate blogs (published and maintained by organizations) are used by 34% of all companies worldwide (2008, McKinsey survey on Web 2.0). There are internal blogs (on companies‘ Intranets, for employees) and external blogs (publicly available on the Internet). JuraBlogs lists more than 200 law blogs for the German-speaking region. In the US, over 25% of the law firms have external blogs (2007, LexBlog). For European law firms I haven’t found any valid numbers, have you? Heute war ich auf der Veranstaltung „Kollaboratives Arbeiten: Wissensportale – Web 2.0 – E-Collaboration“ – und die war richtig gut! Fast alle der Präsentationen haben mir gefallen – manche ein bisschen basic, aber das schadet nicht. Übermorgen soll es die PDFs auf der Con.ect-Website (hier wird das wohl sein, scheint bereits vorbereitet) geben.